Afif is F.O.U.R! 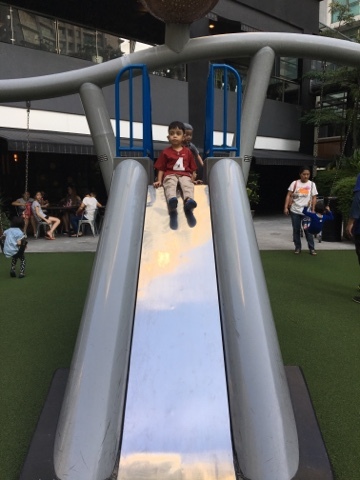 | Teefa Says..
God, time seems to move on so fast and before i know it, my eldest son is 4 already! Gone were the cuddly infant years and the toddler years with all the tantrum and mood swings. My now 4-year-old son has became a little man. i have so much to say about Afif i don't even know where to begin. First of all, he has grown tall and thin. All the baby fat on him? Poufff, gone! We always get comments from people "Kurusnya Afifff!" and "Kenapa Afif makin kurus ni?" Well people, no, we don't starve him. In fact, it's the complete opposite wehhh. Everyday for breakfast he eats soft-boiled eggs (3 eggs for both him and Dhani). An hour after that he's ask for food (usually peanut butter-choc sandwich or banana). At around 1pm he eats lunch, usually rice with a protein (chicken or fish but his fave is egg tofu) and vege. Kalau lunch feveret tu memang 2 mangkok pon licin. Around 3 or 4pm makan snacks (biskot, roti, coklat, banana or grapes). Malam makan lagi nasi or pasta. Banyak kan dia makan kan? i also dunno why he looks thin. Vitamin pon bagi. To be honest kadang terasa la jugak bila orang asik cakap kurusnya afif. 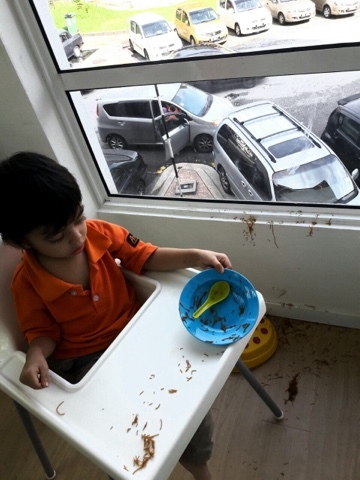 Macam aku tak kasi anak makan plak kan? Then again i feed him good stuff, i know he has normal appetite and he is not sick. His BMI is within the normal range.. So tak kisah la kan kurus pon sihat and i know that i look after him the best i could. Memang Tak Habis Energy Ye Afif? Afif memang sangat energetic. Kalau weekend or cuti sekolah memang dari pagi sampai malam la dia berjaga dan melasak. No naptime whatsoever. Aku kalo weekend memang penat la dari pagi ke malam melayan dia. On school days dia tido tengah hari. Tu pon lepas brapa lama sekolah baru dia adapt to the tido siang culture. Tapi yang elok nya dia tak berapa tido siang ni, malam cepat je dia tido. We try to impose early (sorta) bedtime for our children.. Kol 8.45pm dah get ready dalam bilik.. Bedtime story, minom susu, gosok gigi & pakai pampers (he still sleeps with diapers on haha) and around 9-9.15pm, lights out. Skang dia punya feveret is jadi gymnast. Dia boleh buat terbalik-terbalik tu weh. Terjun dari kerusi siap terbalik badan. Tak lama lagi agaknya boleh buat cartwheel. Haha. 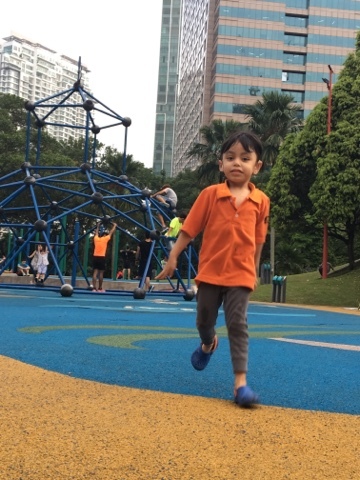 Kalo murah rezeki boleh la consider masuk gymnastic classes ye dop? After further discussion, we agreed to put him in Behavior Modification Program (BMP). Untung nya sekolah Afif ni ada mainstream playschool, mainstream preschool and also program for special needs kids which is BMP ni la. 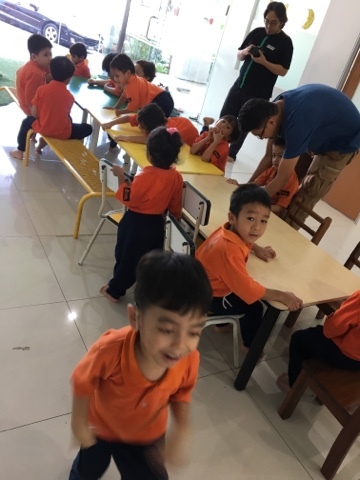 Kat BMP dah included speech therapy, occupational therapy, water therapy, and the teachers are experienced with special needs kids with conditions like autism, ADHD, dyslexia, to name a few..
Memula risau la jugak sebab most kids at BMP are non-verbal. Maknanya tak bercakap sangat. Macam mana Afif nk bercakap kalau kekawan tak bercakap kan? But we realize in order for him to progress better, he needs to learn to focus, follow instruction and have high sitting tolerance. So we give it a shot. He started his BMP program in August. Alhamdulillah after almost 3 months, memang nampak la progress. The first 2 weeks tu dia memang takmo masuk kelas BMP tu. 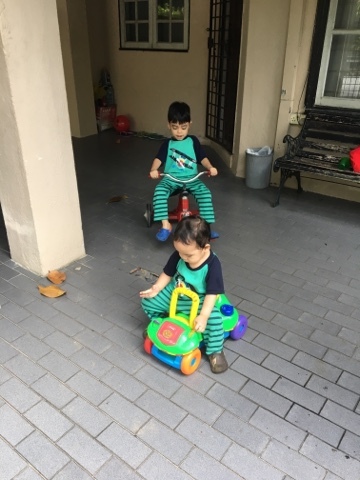 Menangis nak naik atas (kelas playschool). Tapi lepas tu, he loves it. We notice he is happier. Malam sebelum dah kata "Esok gi sekolah.. Jumpa teacher.. Jumpa Kawan.. Jumpa Isyraff.."
Progress lain adalah dia lagi senang follow instruction dan paling ketara he speaks English! Seryes yang ni mak terkejut. 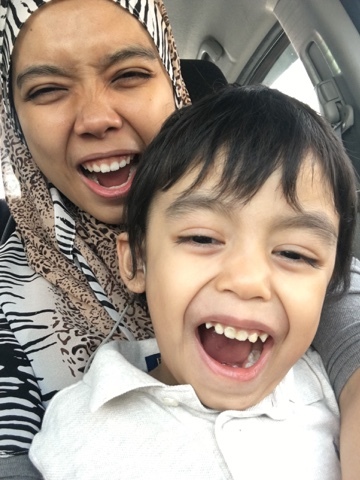 Sebabnya we speak Malay at home coz that is the normal practice bila ngajar budak pekak bercakap (speak one language or kalo nk sangat dual language, one parent kene cakap 100% Malay, one parent cakap 100% English which memang tak laa kan). Sekarang ni dia boleh count 123 in both language, knows colors in both language, and understand simple instruction in both language (sit down, stand up, be gentle, wash buntut haha). He knows ABC and when we read books, i sometimes point to letters in words dia cam those letters. Maybe next step is to teach him reading la kot but before that, kene improve his focus. We still have to work on his attention span but these progress are good enough for now. Berbaloi la spend beribu yuran sekolah sebulan bila nampak progress kan..
i remember being worried about his future and his ability to talk when he was first diagnosed with hearing loss. Alhamdulillah after 3 years of wearing hearing aids and 1 year of using the cochlear implant, he can now talk! He talks in 2-3 words sentences. If we're lucky dapat la 4-words sentences (tapi sangat jarang la). He doesn't have tantrums anymore coz he can now express his feelings and what he wants. Among his words are..
Mama, lapa la.. Jom makan. Air apple habis. Jom pegi kedai. Esok Afif gi sekolah. Jumpa teacher, jumpa isyraf, jumpa kawan..
Daddy takde. Daddy gi keje. Pinjam telefon. Nak (main) Minion. Afif tanak swimming. Nanti tenggelam. Afif nanges. Kadang tu memang aku stress jugak weh sebab dia cakap non-stop. Dulu nak sangat anak bercakap. Ha skang non-stop dia membebel tau pon penat nak layan. Mama! Angin.. Pokok goyang nanti jatuh! InsyaAllah with more hard work and practice, he will continue to progress and hopefully talks like typical kids. 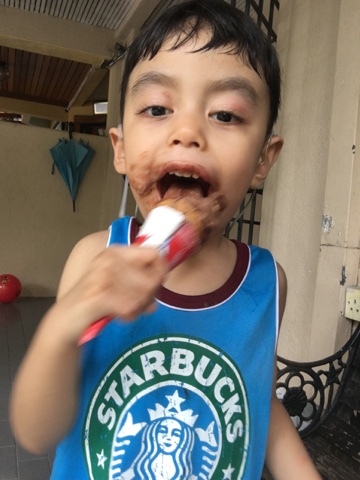 Afif is a fun-loving, happy, friendly, sweet and smart kid. He loves saying hi to random strangers and making friends. He loves playing with water but tak suka gi water therapy sebab nanti kene benam dalam air. Haha. He loves animal. His favourite foods are creamy pasta, nasik lauk labu masak lemak or tofu telur. His current favourite shows/movies are Minions, Tangled, Wreck-it Ralph and American Ninja Warriors. He loves playing Minion Rush game on the iPad and he is so good at it. He loves doing puzzles. He loves his brother Dhani so dearly and he sleeps hugging or holding Dhani's hand. On the other side, he could sometimes be rough, impatient, careless and overly lasak. Bila bergaduh ngan Dhani tu aku rasa nak tamparrrr je dia. Bila kat mall tu cam pelesit dia lari. He does not like spicy food at all. He has a bestfriend. Nama dia Isyraff. i think the main reason why he loves going to school is Isyraff. He loves talking about Isyraff, even with his limited vocabulary. Selalu cerita Isyraff marah, Isyraff nanges, isyraff langgar dinding pastu jatuh.. Pernah sekali ni hantar dia gi sekolah. Dari jauh dengar budak jerit "Afifff!" Rupanya Isyraff baru sampai. They ran towards each other and hug. Macam la setahun tak jumpa. Haha. We didn't do much for his birthday celebration this year. Kami celebrate sehari awal kat sekolah je. Beli cake and prepare some goodies for his friends and teachers. 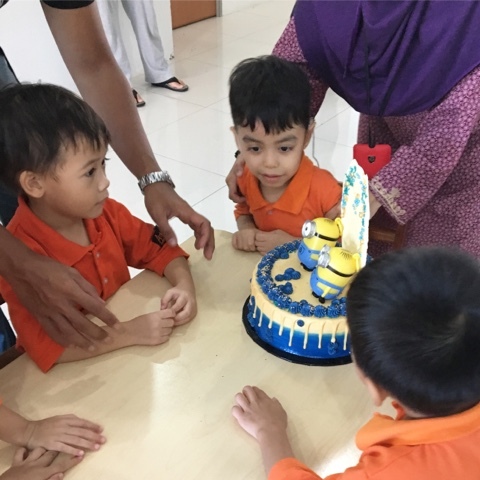 Tema nya adalah Minions sebab dia gila Minion masa tu. 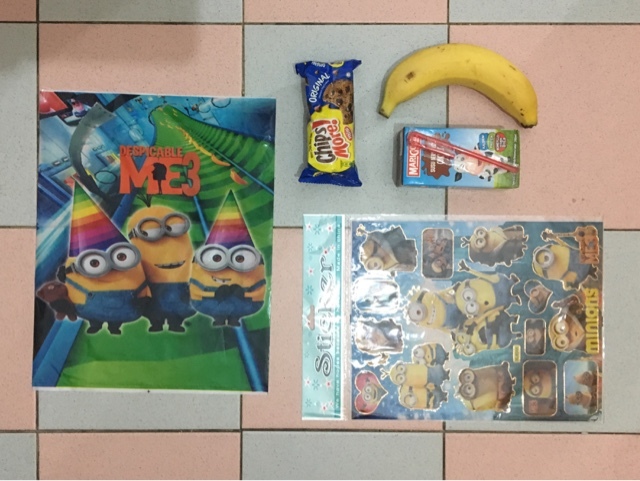 Minions cake and Minions goodie bag (siap pisang okayyy..) Suka dia celebrate ngan kawan-kawan. 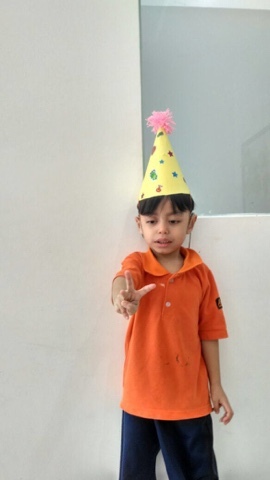 On his birthday, kebetulan ada speech therapy at Institute HEARS. Dia demam sebenarnya tapi bila therapist bagitau ada kek, kami datang juga. Tapi ye lah birthday boy demam kan.. Duduk monyok je dia. Kesiannn.. Haha. But i'm so touched by the effort by Dr. Basha and team. Last year pon diorang celebrate birthday Afif. Semoga Allah balas yang baik2 untuk doktor. 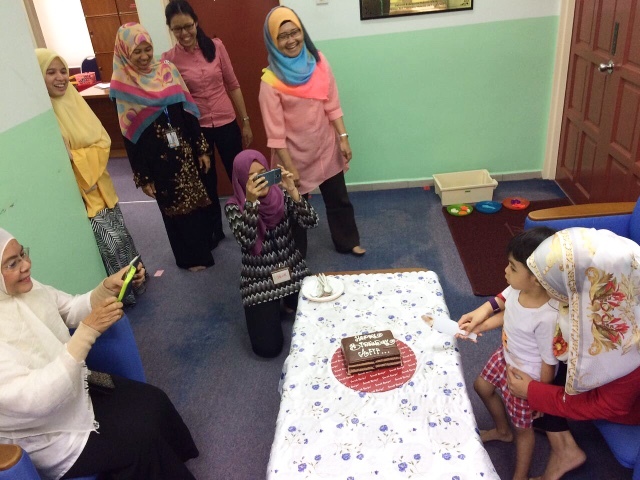 Afif birthday celebration at Institute HEARS. 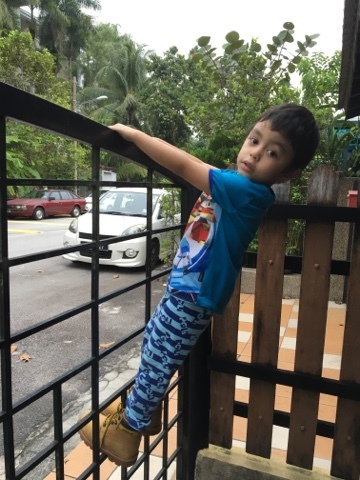 Afif demam, terus tak ingat nak bergambar bagai. The hijabi lady in pink is Dr. Basha. She is the one we're forever indebted to. She plays a huge role in Afif's speech & development. i'm so grateful for my boy. Walaupon dia ada kekurangan, Allah lebihkan banyak untuk dia. 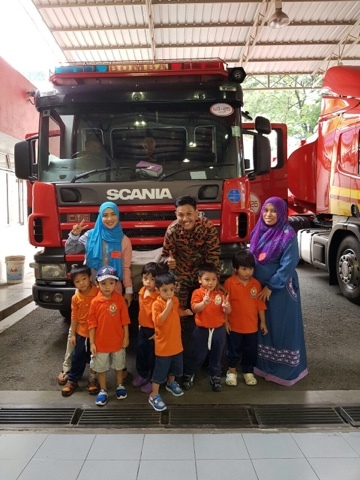 Ramai sayang dia, hensem plak tu (sape lagi nak puji anak sendiri kan? Haha). Baik hatinya. A happy and friendly kid (Dr. Basha's words). i pray that Allah continues to keep you blessed with good health, abundance in rezeqi, terang hati and stay good & pure inside out. Mama & Daddy love you so much.